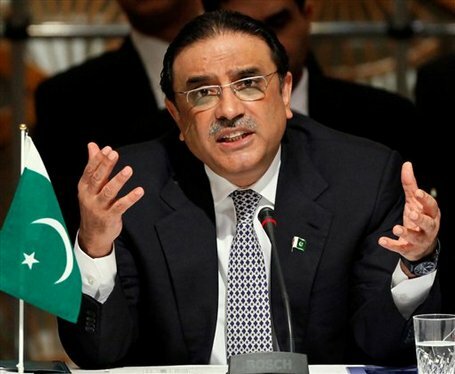 President Asif Ali Zardari has called for transforming bilateral transit trade agreement of Pakistan and Afghanistan to trilateral transit trade agreements with the Central Asian Republics. He said this in two meetings, first, one-on-one with Afghan President Hamid Karzi, and second during delegation level talks headed by the two presidents at Aiwan-e-Sadr on Friday. Spokesperson to the president, Farhatullah Babar said matters related to bilateral relations, Pak-Afghan Transit Trade agreement, shared threat of militancy and terrorism, need for working out joint strategy, enhancing various modes of connectivity and speedy implementation of mega connectivity projects and situation in the region were discussed. He said the meeting of the two presidents was held in a very cordial and constructive manner in which a whole gamut of relations and issues of shared concerns were discussed. The spokesman said that before the initiation of formal talks, President Karzai expressed his heart-felt condolence to President Zardari over the death of his father. It was also agreed to further promote cooperation in connectivity, infrastructure and energy fields to further boost economic development of the two countries. The two presidents also agreed to develop mechanism to implement mega projects like Peshawar-Jalalabad-Herat Expressway and Peshawar-Jalalabad rail link. President Zardari said it was heartening that the two countries had reached an accord on implementation details for the transit trade agreement. The president said the next step was to upgrade the bilateral level transit trade agreement and enter into similar arrangement with Central Asian Republics. He further said that transforming bilateral agreement into trilateral arrangement would usher into new era of development of the region by creating a win-win situation for every country involved.